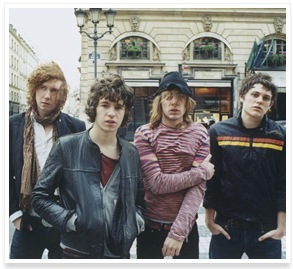 Well, The Kooks were certainly the most played band in my collection this week (Last.fm says 187 plays). This is one of those surprising bands where you don't really realise how much you like them until you take a listen to their albums and realise you know every single song already! The Kooks have been the darlings of Xfm for some time now (which will certainly account for me knowing all of their songs as Xfm do tend to overplay the bands they support). However, it was only when I heard their latest single "Sway" that I started to pay real attention to their music. The song was written about their former bass player Max who had to leave the band because of his problems with drugs. If you have ever had any encounters with addicts or addiction then you'll know that the message of the song is spot on: take your time, look after yourself, do what you need to do - I will be here when you get better. Or you can visit them on MySpace, Last.fm or their website. Okay, you have got me good. I've just played "Sway" for the fifth time now...lol. Guh. And then I went searching the Net for pics of Paul...*double guh* So pretty! Thank you for the rec, I love having new stuff to listen to. V! I am so glad you liked it! What other type of music do you listen to? V - I haven't heard of a couple of those! I'm off to Last.fm to investigate Plain White Ts, Metro Station and Sarah Bareilles now. My niece introduced me to Metro Station and Plain White Ts--though I'd heard of the latter because they're from my hometown Chicago. Metro Station is pure pop fluff by really young guys, but it is impossible to be depressed when listening to them--whenever I'm having a tough day I just pop it in and it cheers me up...heh. @ V: It is amazing when an artist is that good and you know it is pure talent not studio finetuning!